Schulenburg RV Park is located in a friendly rural German & Czech community surrounded by the major metropolitan cities of San Antonio, Austin, College Station, Houston, and Victoria. 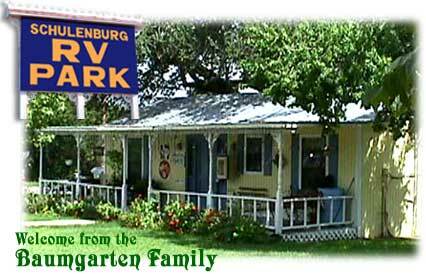 Schulenburg RV Park is one day's drive from the Texas Valley. Drive, motorcycle, or hop on a bicycle for a scenic countryside ride to the HISTORIC PAINTED CHURCHES as well as 4 nearby golf courses. Schulenburg RV Park is within walking distance of 9 eating places, Czech Bakery, Meat Market, Groceries, Family Fitness Center, Antique store, Seasonal activities, Laser RV and Car Wash, and shopping. Visit our NEW Stanzel Model Aircraft Museum, it is a treat! At night, astronomers will appreciate our Dark sky site without having to travel to the MacDonald Observatory. By day, birdwatchers identify birds along the Migratory Corridor between the northern U.S. and Mexico.